Host island-wide stakeholder consultation to compile a list of the hazards to which each island is exposed. Prioritize which hazards pose the greatest level of risk. Apply a scoring system to determine which areas rank as high, medium, or low risk. Map the risk area for each hazard on the most current base map of the island. Assign scores within risk areas using a ranking system. Create a hazard summary map to highlight areas that are vulnerable to impacts from multi-hazards. Development of damageability/vulnerability curves to allow the determination of estimated loss for the category at different hazard magnitudes To assess their vulnerability to hazard impacts. expected loss for each scenario, based on the vulnerability to that hazard (as expressed in the vulnerability curves) and the building/ infrastructure replacement cost. Definition of potential operational impact on each critical facility from each hazard. Identification of areas of special consideration. Identification of special consideration areas that are located in high risk areas. Identify secondary hazard risk consideration sites and key environmental resource sites. Identify intersections of secondary risk sites, environmentally sensitive areas, and natural hazard risk consideration areas. Identify key environmental resource locations and their proximity to secondary risk sites. 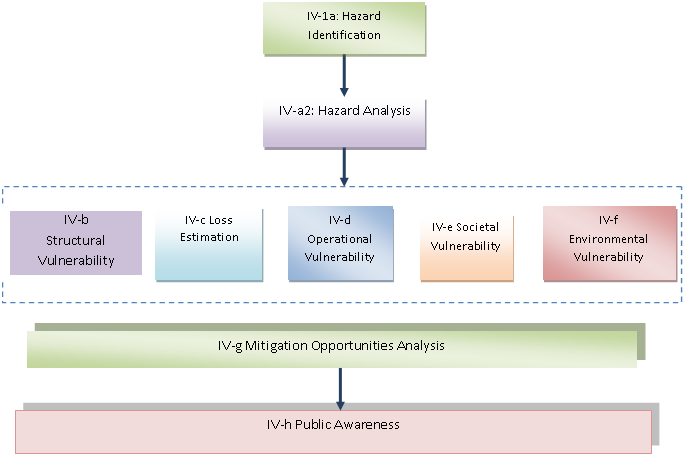 Conduct vulnerability analysis on priority critical facilities. guidelines for conducting detailed assessments of vulnerability on these environmental resource sites. Assessment of the vulnerability of critical lifelines or key resources to various hazard impacts.